To reach a high solar fraction for a given town, a large number of roof mounted solar collector systems will in general be required, as the size of each system is limited by the roof area available. Given a certain area required to reach a specific solar fraction, a large ground-mounted system will often have a much lower total cost due to economy of scale. 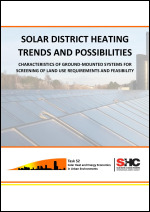 Hence, it is relevant to determine whether it would be more feasible to place large solar collector fields outside a town and supply heat to the district heating (DH) network through a transmission pipe, rather than to install many smaller solar heating systems on rooftops within the town. The analysis shows that the economies of scale of groundmounted solar collector systems can normally compensate for the extra costs of transmission pipes, as long as these are not too long, so that the resulting total cost of solar heat can become acceptable. 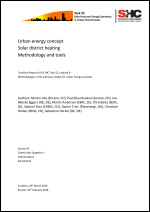 This report aims at answering a few key questions regarding the development of largescale solar thermal systems supplying DH networks, which will be referred to as “solar district heating” (SDH): We have seen a strong SDH development in Denmark in the past decade – what are the characteristics of the Danish SDH systems? and Would it be possible to see a similar development in other countries?